DUBAI, U.A.E., 30th September 2013 - Emirates Group Security has signed a Memorandum of Understanding (MoU) with Dubai Police on 29th September 2013, further cementing the long partnership between the two organisations. Through this partnership, Emirates Group Security and Dubai Police will share best practices and information on security matters, promote joint training methods and organise mutual educational activities. The MoU was signed by His Highness Sheikh Ahmed bin Saeed Al Maktoum, Chairman and Chief Executive Emirates Airline & Group and Lieutenant General Dahi Khalfan bin Tamim, Chief of Dubai Police. 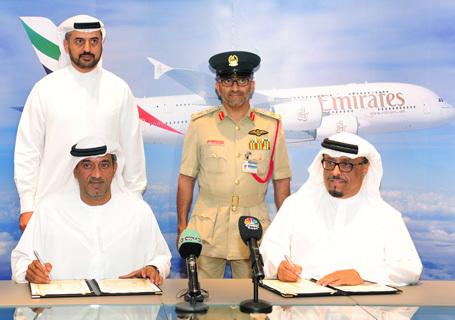 The signing ceremony was attended by Dr Abdullah Al Hashimi Divisional Senior Vice-President Emirates Group Security, Major General Pilot Ahmed Mohammed bin Thani, Director of the General Department for Airport Security at Dubai Police, along with senior management of Centre of Aviation and Security Studies (CASS) and Dubai Police . “Emirates is considered a leader in airline aviation security and Emirates Group Security is responsible for anticipating the current and future needs of the company globally,” said Dr Abdulla Al Hashimi. “The MoU with Dubai Police is a great step to ensure Emirates Group Security meets the needs of the organisation, the UAE, and the international security industry- today and for years to come. This is another programme which embodies the reciprocal relationship between airline and state authorities. “Whether you work for an airline, airport, civil aviation authority or other aviation security service provider, understanding the threats and risks to security and how to manage them is crucial. Sharing of best practices and exploring collaborate efforts in training among major players are important aspects of producing comprehensive and practical approaches to combating threats in the aviation industry,” he added. After the signing ceremony, Lt. General Dahi Khalfan toured Emirates Network Control Centre accompanied by a group of senior management from Emirates Group and Dubai Police. Dubai Police and Emirates Group Security have been working together for years. Because of this successful partnership, the two organizations are considered global leaders for bringing aviation security to a higher level.